For this Iron Craft Challenge, we were asked to create something based on one of four big Spring crafting trends, floral, nautical, geometric and radiant orchid. I decided to go with the nautical trend and take my inspiration from classic sailors tattoos. 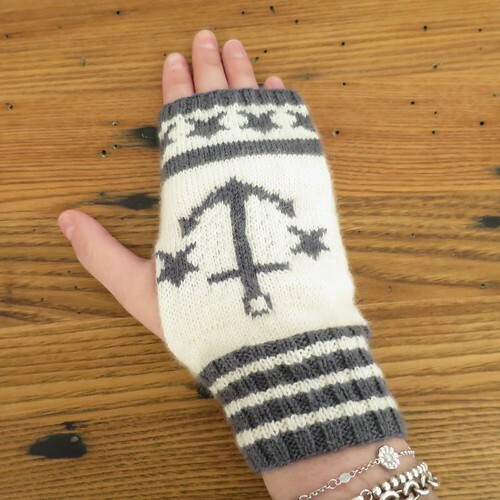 I charted two different designs and added them to some handwarmers. 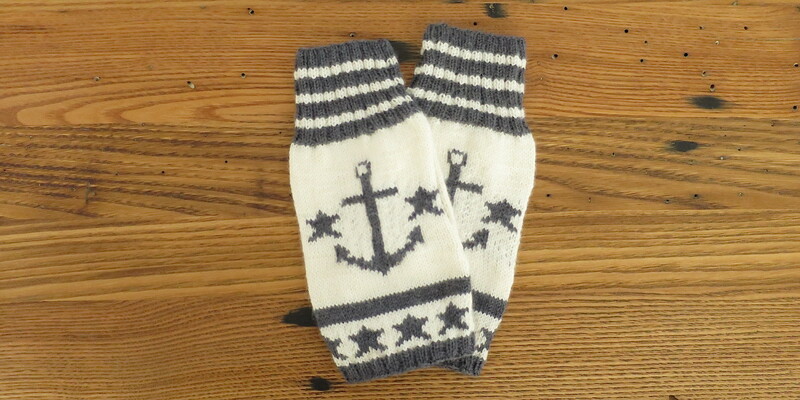 I put the anchor design on the front of both handwarmers and heart design on the palm of just one. Because these are knit in the round and then flat for the thumbholes, I did a combination of intarsia and stranded knitting for the colorwork. I have to say, I’m not completely happy with how the colorwork looks on these. I love the patterns, but the grey really shows through the cream. I’ve not had a problem with this in other colorwork I’ve done, I think it might just be this yarn. I plan on crocheting around the thumbhole to make it a little sturdier, but I ran out of time to get these up. Actually, what I’d really like to do, is turn these into full-blown mittens. I have charted these out the way that I knit them, but you can change them around as you wish. 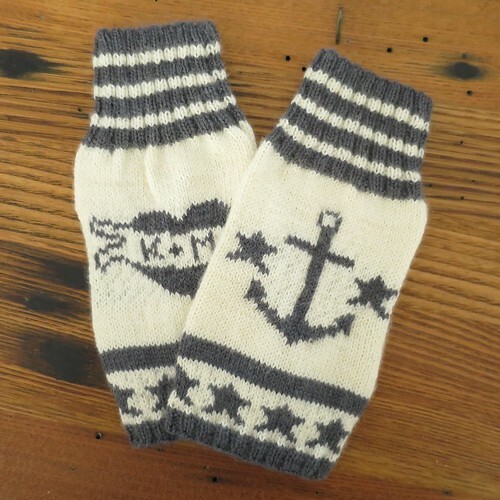 Skip the heart on the palms and just do the anchors or knit the same hand chart twice and have the anchor on the front of one hand and the heart on the front of the other. I’ve also left the banner on the heart blank so you can add your own word (Mom is a classic) or initials. 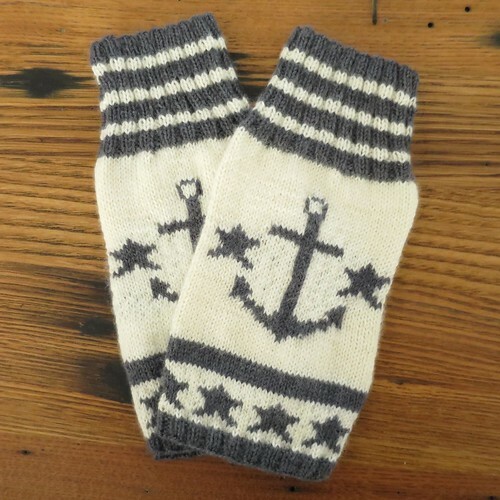 Download the pdf of the Hello Sailor Handwarmers Pattern (with the charts) or just the Hello Sailor Charts. I have knit these in the round but you can easily knit them flat and seam them afterwards leaving a gap in the seam for a thumbhole. Jogless Stripes: If you have ever knit stripes in the round you know that you get a jog or step at the beginning of a round. There is a way to fix this when you have stripes of more than one round. Finish the first color and knit one round of the second color. When you get to the first stitch of the second round of the second color, pull up the stitch below from the first color on to the left needle. Now knit those two stitches together. Cast on 72 stitches with darker color. Divide between 3 needles. Join together to knit in the round placing a stitch marker before the first and last stitch to mark rows. Row: 39: Turn the knitting so you are facing the outside and knit down the row. Repeat rows 38 & 39 until you finish row 61. Row 97: bind off in pattern. If you wish to talk about this pattern on a website or blog, you can use one picture and link back to the post. Let me see–Sailors, Tattoos. What is not to like here. Being a former sailor (USN) I would have preferred them in Navy Blue but otherwise–this is another FANTASTIC project. Well done. I suspect the colourwork issue is more to do with gauge than yarn. If you knit at a tight gauge, you won’t get the colour showing through as much as at a loose gauge. Yeah true, I was doing this at 10 stitches per inch so I had hoped that would be enough. This yarn seems thinner than a lot of the sock yarns I used before.